10.12.2004 - I will now outline and discuss various rodent trapping techniques. When I say rodent, I'm talking about rats (many animals, from squirrels to beavers are members of the rodent family). I only really deal with rats inside homes. There's no way to stop them from living outside. 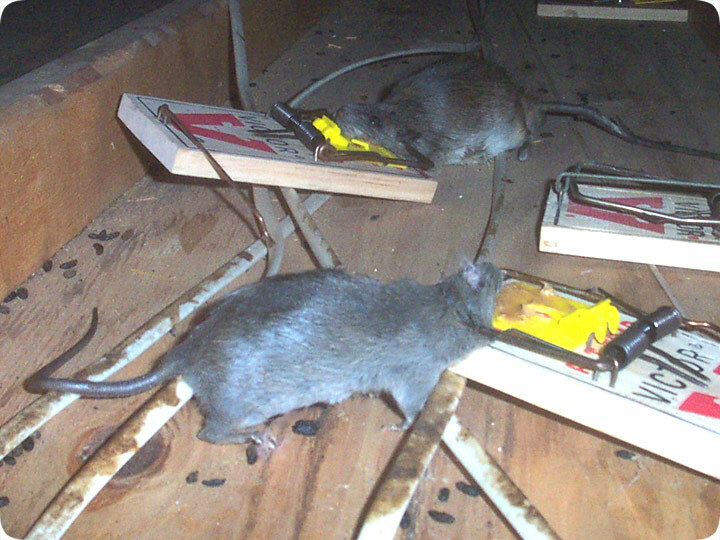 Within homes, the vast majority of the trapping takes place in the attic, because that's where the rats are, most of the time. Customers call me to complain about the scurrying and running and scratching noises of rats in the attic. The customers don't, of course, hear the chewing on electrical wires, the pooping, or the spreading of possible diseases. However, those things are going on as well, and since a rat problem, if left untreated, only gets worse, it's best to trap those rodents as soon as possible. Placement is very important, probably the most important thing. Rats tend to stick to the same pathways over and over again. In the above photo, you'll notice that the electrical wires are stained with a brown greats. That's from the rats, and it's a sign that this is a heavily used rat travel route. Set the traps on the travel paths, and you don't even need bait. Bait doesn't really matter that much. You can actually trap all the rats without any bait, if you set the traps in the right area. But bait does help. There's a million suggestions out there, from bacon to chocolate to pineapple, but it doesn't really matter what you use. Rats are scavengers, remember? I use peanut butter, because it's very easy to apply to the traps, and it works very well. Number of traps does matter, and the more the better. You probably only have a few rats in your attic at any given time, but they could be living or moving anywhere, and the more traps set on the rat runways, the better your chance of getting them all. Setting a few traps around the attic hatch won't do. You need to set at least a dozen traps all through the attic. Type of trap is of course also extremely important. You can set cage traps or glue traps or any number of different snap traps for rodents. Cage traps work fine, but they are often impractical, because you'd have to set a bunch of cages in an attic, the cages wouldn't fit in all the nooks and crannies, and you'd have to check them twice a day. Glue traps are not very effective, and they are inhumane. Snap traps are the best. They work, and they quickly kill the rat without causing it to suffer. They can be set by the bucketload, and in all the little nooks and crannies that rats use. While there are dozens of rat traps on the market, the traditional wooden Victor traps are actually the best (believe me, I've tried all the alternatives). So there you go, those are my rodent trapping methods and techniques. If you need any other rodent trapping advice, just read more of my website or blogs, or call me or a local wildlife removal expert in your area.